Got scraps? How about those cool-looking fabric pieces you find on the bargain table -- not enough for a full garment, but perhaps a yard or so left on the roll? There are tons of things you can do with a yard or less of fabric! Here's a list of fun and useful projects you can try! My wife's a huge LSU fan. 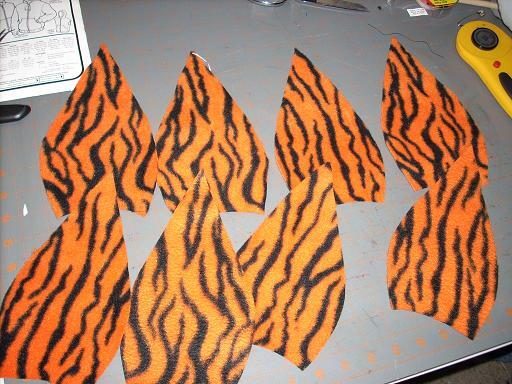 We have tiger-striped decorations all over our house. 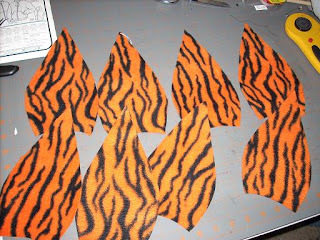 When I found some tiger-striped fleece, I knew I had to do something with it. I've been looking at jaunty sports caps lately, so I decided to do a jaunty tiger-striped beret. Draw a single straight line 8 1/2 inches high. From the top of this line, drop down 4 inches. Draw a crossing perpendicular line 3 1/2 inches long where the tall line bisects the shorter one (that means 1 3/4 inches on each side of the 8 1/2 inch line) Now, drop another 2 inches and draw a 4 5/8 inch line that's bisected by the 8 1/2 inch line. Finally, at the bottom of the 8 1/2 inch line, note where the endpoints of a 3 3/8 inch bisecting line would be. If you need to, click the image on the right for a closer look. This sounds more complex than it is -- look at the diagram and see how the straight lines are laid out. Now, freehand draw in the teardrop shaped sides. 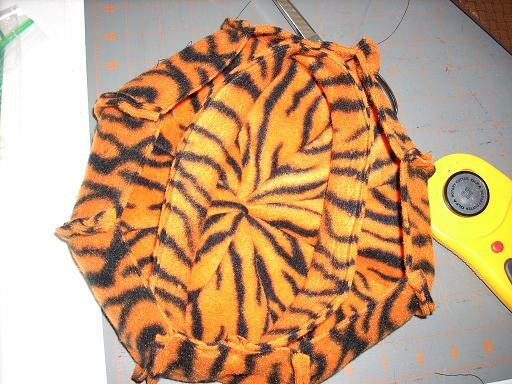 It doesn't have to be perfect -- fleece is very forgiving! At the very bottom of the pattern, draw a concave shaped base that joins those two 3 3/8 inch endpoints. That means it curves in a little bit. That's the only pattern we need! Since our teardrop pattern is a bit less than 5 inches wide -- and since we need 8 pieces cut, lets start with a piece of fleece about 44 inches wide (we'll give ourselves a little cushion) and about 9 1/2 inches high. Fold it in half so that it's 22 by 9 1/2. Now, lay the pattern piece on the fabric and start cutting. 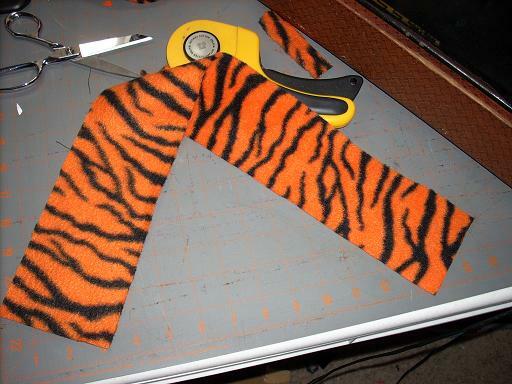 Since the fabric is doubled, you'll be cutting two pieces at a time. 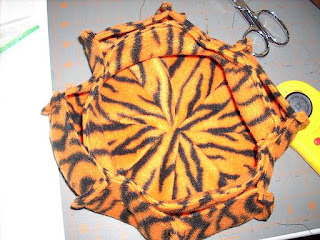 Once you've cut a piece, shift the pattern over and cut the next. When you finish, you'll have 8 pieces for your beret. Note that fleece has a right side and a wrong side. Lay your pieces out so the edges all curl the same direction. Keep them oriented like this. Decide which side of the fleece you want on the outside. Now -- start joining the pieces. Match two pieces (matching the same side) and sew them together with about a 1/4" seam allowance. Keep doing this until you have four sets of two joined pieces. Now, join the sets so that you have two sets of four joined pieces -- or a "right half" and a "left half". You don't actually have to do this -- you can keep joining single pieces together one at a time -- but I found it a lot easier and less confusing to do it this way. Note how the tops of your teardrop pieces will stick out in a little tuft. This doesn't affect anything since they'll be on the inside. Now that we have two halves our beret -- let's join them together. 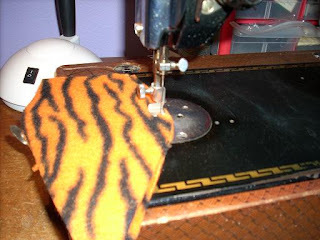 Be careful to keep your seams on the same side! When you sew the top tufts together, it'll get a little squirrely -- not a problem, this doesn't have to be perfect at this point. When you're done, you have a beret that will fit VERY loosely. We need a band around the bottom to make it fit and lay properly. To make the band, measure the circumference of your head, then cut a piece of fleece of the same width, but between 3 1/2 and 4 inches tall. The fleece will stretch -- and we want the fit to be a tiny bit snug (so the beret won't fall off), so we're not adding any cushion to the band. However, after you make the band and try it on, you might decide to cut another one and make it looser (or tighter) as you prefer. Once you've cut the band, fold it in half width-wise (keep the good side on the outside) and sew along the length to close the band. Note that we now have a seam on the good side!?!?! This is okay -- because we're going to hide it in the next step. If your seam allowance is a little ragged, you can trim it off now. I used a rotary cutter -- made it really easy! Now, join the two ends of the band together. You can get fancy here -- like a felled seam -- but you don't have to. You can simply straight seam the ends together -- we'll put the seamed part on the inside when we join the band to the cap. 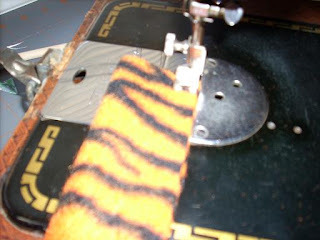 Check the band for fit -- if it's too loose, you can sew another seam. 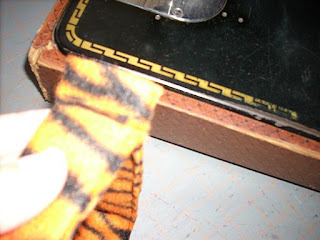 If too tight, then cut another strip a little longer and try again. Normally, circumference of your head will give you a good fit. Now -- here's the neat part. We need to join the band to the bottom of the cap. If you look at the two, the circumference of the band is much smaller than the circumference of the bottom of the cap -- or, the circle made by the band is much smaller than the circle made by the bottom of the cap. This is exactly how we want it! 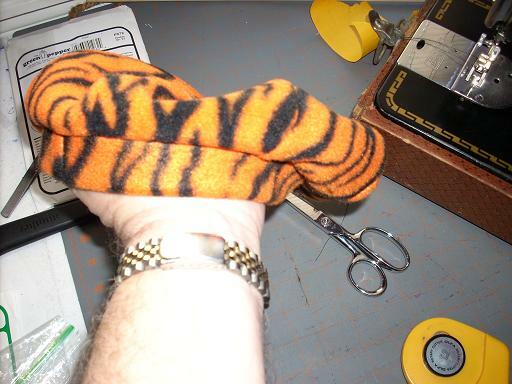 Since fleece will stretch, we'll stretch the band to fit the bottom of the cap. 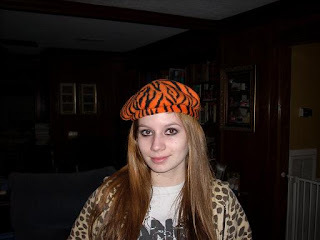 This will also "pull" in the sides of the wider bottom and give us that "mushroom" look of a beret. Start by turning the cap inside out -- all seams to the outside. Now, set the band inside the cap and match it up with the bottom of the cap. 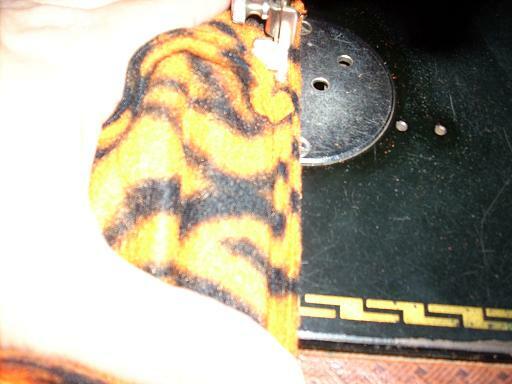 Have the seamed part of the band matched up with the bottom of the cap. When we later turn the cap right-side out, the seams of both the band and the cap will be on the inside. I started by pinning at two positions -- 12 o'clock and 6 o'clock. This positions the band and puts half of the band on one side of the cap and half on the other side. Now, pin the middles of the band to the cap at the 3 o'clock and 9 o'clock positions. If you want, you can add more pins -- but four should position the band properly if you're careful. 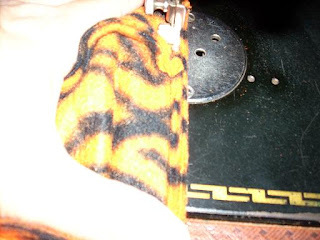 Now -- stretch each individual segment (between the pins) of the band so that it's the same length as the cap bottom -- and sew the band to the cap. If you find this hard to do, you can add another few pins. And ... you're done! Turn the cap right-side out -- note the neat "mushroom" beret shape! 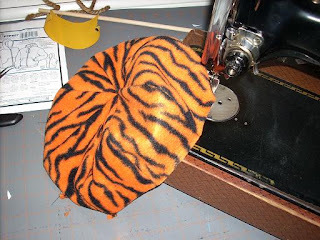 I left my beret just as it was -- but you might want to consider adding some sort of pom-pom to the very top where all the teardrop segments meet. 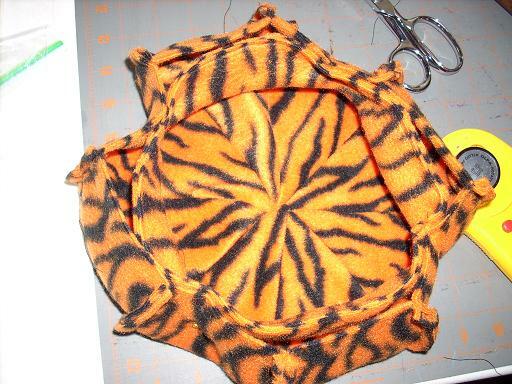 You could even cut thing strips of matching fleece to make the pom-pom. That's kind of girly, but it might work just right in the right situation. And -- here's my model again. 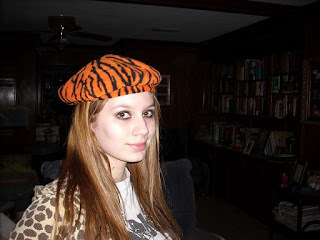 I think she's practicing how to flop the beret in just the right way for her fashion statement! I have to say...I LOVE your tutorial!! You made this very easy to follow. 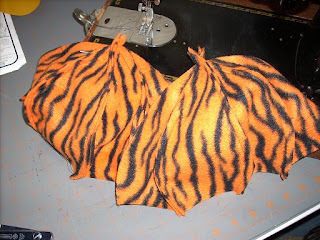 As soon as my sewing room is put back together (I am in the middle of de-stashing), I will be sewing a few of these for the up coming Christmas for presents. Thank you for this!!! I love that, it's perfect! I can't wait to make one, (hopefully many) thank you so much. I also love that you have an old sewing machine. So many are being discarded as old junk, but they stitch perfectly. Remember that fleece stretches more in one direction than the other. The "stretchy direction" should align with the width of the band. The panels should match the pattern direction on the band. I forgot about that little fact and got to make the beret twice! Thank you I love this pattern. Now I know what to do with ALL THAT FLEECE I have!!! 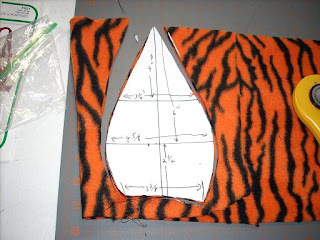 This is about the best tutorial for sewing that I have found on the internet. Directions are clear and concise and pix show what you need to see. Just made one of these in less than two hours from creating the pattern to finished hat. Love it. Thanks so much for your kind words! I hope you enjoy the beret! Looking for great deals on used and new sewing machines, fabrics, notions, patterns, and much more? Check out this site! Tons of sewing and craft resources! I'd love to swap links with other crafty and sewing sites -- please drop me a comment if you'd like to swap!